Hello there, today I am taking part in Julia's What's On Your Workdesk? Wednesday. 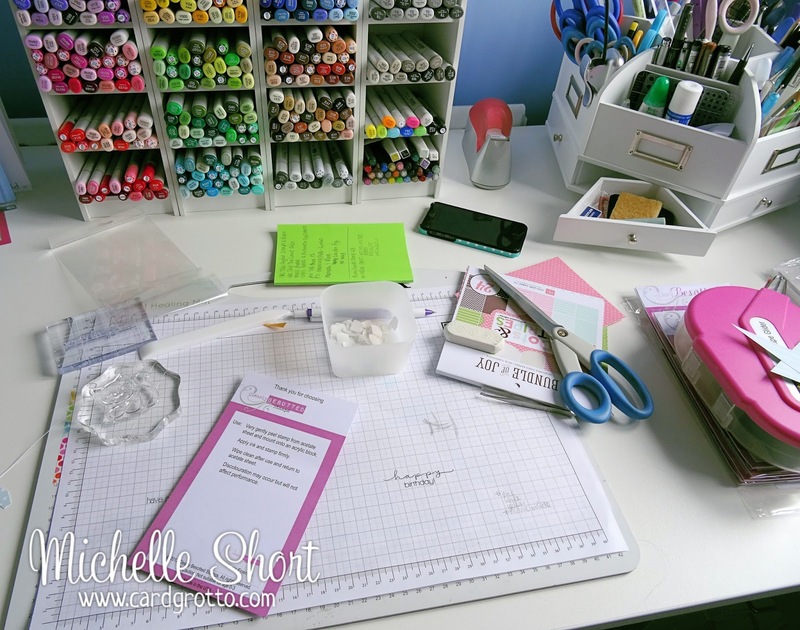 I often get asked how I keep my desk (and craft room in general) so tidy. My secret is to have a place for everything. My black ink pads (the ones I use the most) are kept in my top left hand drawer under my desk so as soon as I have used it I can put it back. My Copic Markers are in front of me so they can pop straight back in the cubbies. My handheld tool are also on my desk in my carousel so they can pop straight back in there too. My adhesives are in the top drawer to my right under my desk. My stamps, dies and paper pads are behind me so they are in fairly easy reach too. It really is still fairly tidy. The black ink pad that I used to stamp my images is already away as I got into the habit of doing that after stamping. The paper pad I used is still on my desk as well as a few various tools. I can put them away easily though, the tools I can just pop them in my carousel and the paper pad in the box behind me. The ATG laying on my new Clearly Besotted Stamps (for the March release) will also go in my carousel. The stamps will remain on my desk so that I can see them and get inspiration from them until I have made all my samples then they will be stored away like my others. The actual stamps I used for the card have been cleaned already but need to be put away on the stamp sheet. The little pot you can see? that is where I put all the backs of my 3D foam pads in otherwise they end up stuck to the bottom of my socks and walked around the house. How do they do that?! The green Post-It note pad has the details of the products I have used on the card. It helps when I write up my post and make my InLinkz product lists. That is what is on my workdesk today, what is on yours? Thanks so much for visiting me today. Tee hee, I'm used to seeing a tidy desk from you! Love your YouTube videos Michelle. I work like that too Michelle I tidy as I go, I love the idea about the backings of the foam pads, I trail them with me wherever I go to, hubby will defo like your idea of the tub!!! So envious of your pen collection lol. Thanks for sharing. Saw you on WOYWW and thought I'd say Hi. So nice to see an organized desk! Love your carousel! This is what my work desk would look like - if I had one! After 5 years as a card maker I still work on a folding table, I can only dream of a crafting space like this. Maybe one day! In my last craft room I had a build up desk that was nice and clean like yours, sadly I do not have space now. You cant see me but take it from me I am sat OOOOing over yours. Will be back to read more of your blog when I finish posting on all of the desks this week.